A chess piece [pawn]: one of eight on the board, spread across a frontline of attack. Multiple in number but restricted in advancement, its movements can be split into three broad categories in the game: sacrificial, decoy and transformative. This metaphor is the essence of Architectural Review Asia Pacific’s 130th issue – allowing for investigative writing and project reviews that respond to the framework but are not dependent on it. 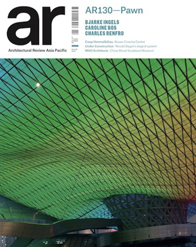 This issue looks at the import/export of architectural practice – not limited to simply a building’s physical location, but also in terms of collaborations, strategic alliances, data gathering, confluence of ideals and the fabric of identity. The reincarnation of Architectural Review Asia Pacific sees the magazine’s focus switch to critically engaging in the conceptual practice and construction processes from within the architectural discipline, exploring the design process with a distinct focus on buildings, forming a ‘working narrative’ that extends beyond each individual issue. Plus: One to watch – Facet Studio; Gretchen Wilkins on prototyping urbanism; in conversation with Gerard Reinmuth; and Austin Williams reviews Splendidly Fantastic: Architecture and Power Games in China.